Marcel Breuer, Reclining Chair, designed 1932. Milwaukee Art Museum, Gift of the Friends of Art. Photo by Larry Sanders. My favorite design objects are those that ring familiar, but also offer a story-telling twist, like Marcel Breuer’s aluminum Chaise Longue No. 313–or Reclining Chair–in our Museum’s permanent collection. Celebrated for his pioneering tubular steel furniture made at the Bauhaus in the late 1920s, Breuer continued experimenting with new materials through the 1930s. This springy lounge form is better known in the later plywood version by Isokon, but in this aluminum prototype we see Breuer applying his Modernist ideals about manufacture’s inherent link to craft. Chaise Longue’s slight imperfections tell us it was crafted by hand, but it explores design principles—like simplicity and non-waste—appropriate for mass-production. 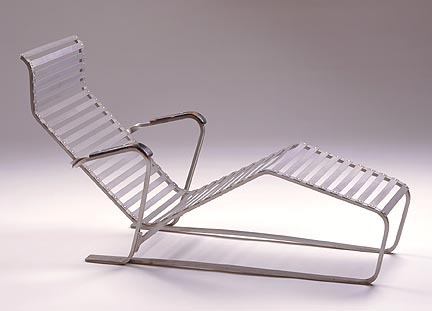 With the Swiss firm Embru, Breuer entered this design in a 1933 “Best Aluminum Chair” competition organized by a French aluminum trade organization. The clever lounge, with the aluminum “split” to bend vertically up from the horizontal base, took first prize twice from two independent juries. In form, I love how the horizontal slats form planes that suggest a human casually suspended in space. I’ll admit that I’ve never passed Chaise Longue in our 20th century design gallery and not suppressed an urge to test out the fit! This entry was posted in Art and tagged Design, From the Collection, Marcel Breuer. Bookmark the permalink. I am very pleased to see our “Aluminim Liege 313” in your collection. competition of the “Alliance Aluminium” Basel (Switzerland), hold in Paris. In the one of the juries we saw Le Corbusier, W. Gropius and other architects. After this we produced this furniture and similare chairs up to 1940.
a lot of furnitures from this period.